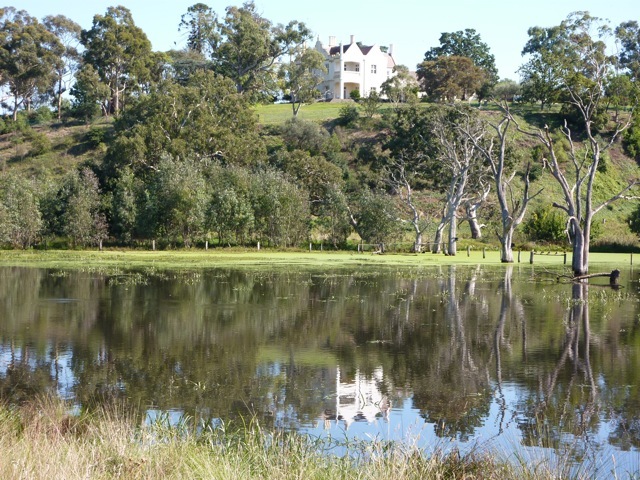 Banyule Homestead in all its glory - how long for? This is a very disappointing decision for Banyule’s and the State’s heritage. It will set an unfortunate precedent or development on or adjacent to heritage properties elsewhere in Banyule. Whilst the decision places a number of conditions on the permit, these largely go to a schedule of works which will go towards renovation and repairs. However, given the likely sale price of the three units which will have views across Banyule Flats to the Ranges (likely to be in excess of $1 m each) the owners will still make a substantial profit. The units have not been scaled down or amended to lessen their visual impact, especially when viewed from the East across the Banyule wetlands. This project will however still require a planning permit which would have to be approved by Council (who opposed the application on the last occasion). If the packed gallery at a Council meeting earlier in the year is any indication of the strength of feeling amongst the community on this, the owners should expect there will still be strong and passionate opposition to this project, which has not diminished. It is clear that the community in Banyule are willing to stand up for theirs and the State’s heritage and are not going to now lie down and let this significant piece of our history and heritage be diminished by such inappropriate and insensitive development. This entry was posted in Banyule Flats, Banyule Homestead, Heritage and tagged banyule homestead, buckingham drive, City of Banyule, Heidelberg, heritage, historic. Bookmark the permalink. The “development” frenzy in Victoria is indicative of lack of innovation and ideas from our political leaders. They, under the smoke-screen of Victoria’s chronic housing shortage, continue to allow all sorts of building permits and inappropriate developments – contrary to public opinion and submissions. Democratic principles continue to be rough-shod and over-ridden so that developers are assured of success. The housing shortage won’t be fixed while we have a Ponzi-economy based on ongoing and perpetual population growth. It just shifts the home-owning potential downwards, while the well-heeled are rewarded. The heritage value of the property will be tarnished forever. Any plans to re-open it for the public, who should have access to it, will be compromised. Joseph Hawdon’s home, and his pioneer status, will be lost in history and to future generations in our fragmented society. Heritage matters little to this Baillieu State government. Incredible that “Heritage” Victoria should make the decision to allow this development on a heritage and significant historical property! It’s a sad irony. Really sad to hear the news….I still think Banyule Homestead would make a fantastic gallery space (similar to Bundoora Homestead Art Centre or Montsalvat) if someone had the vision for it especially when a gallery space for Banyule has been mooted for this area in the long term. I completely agree! It was once a gallery but not well publicised. One day it may see owners that are future thinkers rather than hip pocket gazers. The response from “Heritage” Victoria ironically mentioned nothing about the heritage or historic values of Banyule Homestead. The only concession was that the owners, in return for the privilege of being able to profit from this site that should be in public hands, is that he contribute $400,000 to renovations. This is nothing compared to the amount devalued from the integrity of the property, and that this amount is just a token to the real cost of upgrades. Economic values were the only criteria mentioned, and the number of people and the Council against the proposals were ignored. This should mean that Heritage Victoria’s green light is invalid due to inadequate and shallow decision-making at its worst! Could the writers of this blog please stop making these things up? A significant part of the plan for subdevelopment as it was approved by Heritage Victoria is that the views of the Homestead be protected, and as such any units developed on the block should have NO visual impact on the Homestead itself, especially when viewed from across the Banyule wetlands. Furthermore, without knowing anything about the units (which do not even exist yet! ), when they’ll be completed or what the housing market will be like at the time, how can you possibly calculate that they’ll “likely” be worth more than $1m each? Feel free to prove me wrong (though if you intend to do so, please do offer proof; don’t just rationalize your guesswork), but it seems to me like you just picked an outrageous figure that’s not only impossible to prove but also guaranteed to get people upset. I can appreciate some of the work that the Friends of Banyule do, but it seems that when it comes to issues like this you prefer to sensationalize what little you know to whip people into a frenzy rather than risk allowing them to consider the facts and come to their own conclusions. Unfortunately continued misrepresentation of the facts like this will make it impossible for people to consider the plan with an open mind. Lukekul, you have obviously got vested interests in these developments – one of the few who will benefit. You are nit-picking what has been said, but you are ignoring the holistic panoramic view of this permit. The property needs to be exist in its entirety. It’s not just a house, but part of a big picture, and Melbourne’s history. Unfortunately, history is under-valued today and not appreciated or taught as it was in the past. Our largely multicultural population is mostly ignorant and uninterested in Australia’s pioneer beginnings and have no connection with it. Patriotism is often considered “racist” and “bigotry”, in view of globalization and immigration. Our history is fragmented, and assumed to be of little value, and so is the remaining land of what was this heritage property – of an elegant by-gone era of Melbourne’s infancy. As I understand it, the property was once in the hands of the government and it was used as a gallery. I also understand that during this time there was internal work undertaken to facilitate its use as a gallery that completely disregarded the integrity of the dwelling and destroyed much of its originality. The government eventually sold it off, to rid themselves of the costs of ownership I suppose. I have no vested interest in the development, but from what I have seen there would be minimal impact. In any case, perhaps the friends of Banyule might offer a solution instead of standing in the way of what might the only way to preserve the property for subsequent private owners or community to enjoy. How many friends of Banyule live on properties that once a part of the origninal concern? I wonder whether they would apply the same reasoning to the piece of history that their own house is sitting on and enjoying those same views across Banyule Flats? It might be clear that the community in Banyule is not going to lie down and let this piece of ‘their’ history be diminished, but what are they offering as an alternative? An excellent alternative would be for the State Government together with the City of Banyule to buy back Banyule House and return to its formenr use as a gallery, as it previously was, run by the National Gallery of Victoria between 1975 – 1995. Other local and regional galleries such as Bundoora Homestead operated by the city of Darebin, operate successfully, have annual art prizes promoting local artists and contribute to the cultural life of the community. In this case this location has special significance being the bithplace of the Heidelberg School, Mc Cubbin, Conder, Roberts etc, one of Australia’s most important and iconic art movements. Many of their works were painted in and around this area. This would also be a bookend for nearby Heide Gallery, home of the Australian Modernists, Nolan Tucker, Boyd etc, another of the most important Australian art movements. Banyule House would make the perfect setting for such a home for Heidelberg School and other art of the region, with its imposing and unique Elizabethan edifice by colonial archtictct John Gill (c1846). It is one of the eraliest surviving houses in Victoria and a rare example of a pre gold rush era homestaed from this period. We should not pass up this oportunity to preserve a piece of the state’s history and to re establish Banyule House as a gallery and a home for the Heidelberg School and other signifiacnt Austarlian art. If proprely run and promoted, such a gallery would contribute to the cultural life of Banyule and the region and promote tourism (which could be combined with tours of Banyule Flats conservation area, Heide Gallery and the area generally). Importantly it would, preserve a unique and irreplacable peice of our history and heritage. I am appalled that this permit has been granted. This house, and its surrounding land, was purchased in full cognizance of its heritage status, not just for the local area but for the nation as a whole. Yet National, state and local protection is obviously not enough. Where to from here?